It was a still and crisp sunny April morning in SW England, the sun had not long risen and the birds were singing. I had just emerged from my first vision quest, which had included a sweat lodge, a four-day dry fast and then another sweat from which we had just surfaced. I am told the final sweat was incredibly hot, yet it was the easiest and most pleasant sweat I had known- I was in a very altered state. I stood in the centre of a wheel with eight men holding the directions and my mentor leading the ceremony. I had a profound sense of inter-connection to everything around me, I felt deep love for those gathered- I felt love for all creation. The men were testing me to see if they deemed me worthy to be called a “man”, somehow, I intuitively knew the answer to each test. The words that spontaneously came from my mouth were exquisite, I did not think, each one surprised me as I witnessed wisdom flow from my 27-year-old mouth. Eventually I stopped answering their questions and began spontaneously praying, until my prayer ended with “… from now on my footsteps will be my prayers.” My mentor said to me “In this moment you are a holy man.” Those words went deep and I believed myself to have been magically transformed into a modern day holy man, a wizard. My quest was part of an apprenticeship to a medicine man/ shamanic practitioner. We had been working together for several years yet I was still unprepared for such an awakening. Previously I had lived a life of un-integrated extremes with periods of smoking marijuana all day and an addiction to falling in love, alternating with periods of spiritual athleticism, to include a sattvic diet and practicing yoga several hours a day. Both had enabled an avoidance of suffering and the inevitable tension that comes with living a life of purpose. Having not heard of Van Gennep’s three phases, or the word Incorporation, I imagined myself to be magically transformed. I had no context to understand incorporation and I was blissfully unaware that a transmutation of my personality would be required if I was to live the vision received. Two days after my quest, I simply got on an aeroplane and flew back to the Caribbean where I worked as the captain of a luxury sailing yacht. My life as a yacht captain serving the whims of charter guests became no longer satisfying, I was ready for another type of service. At this stage I was very identified with my ego and movement towards expressing my vision was relatively unconscious. I fell back into addictive behaviours and flip flopped between gratifying egoic drives and spiritual purity. The gap between vision and reality seemed too wide to bridge. Nevertheless, eighteen months post quest after considering studying psychology and having this decision mirrored to me by a trusted elder I returned to England and began a master’s in Psychosynthesis Psychology and training to be a psychotherapist. Psychosynthesis psychotherapy is psycho-spiritual and best suited to supporting healthy neurotics (like you and me) to further Self-realise and actualise. It’s founder Roberto Assagioli, an analyst and esoteriscist, was a contemporary of Freud and Jung. He first published papers on spiritual emergence and emergency in the 1930’s. Psychosynthesis training involved participating in group work and individual psychotherapy for four years. I began noticing the impact I had on others and the disparity between who I believed myself to be and the reactions I received. This was a painful mirror and I would flip flop between hiding in spirit and denying my vision. Nevertheless, I knew both to be real/ true and this created tension within me. Fortunately, Psychosynthesis provides a context for this and I was held by a community specialising in integrating spiritual awakenings. The mythic return of the hero, when considered psycho-spiritually, is the building of a bridge between who you have been and your innate potential/ True Self. There are many different levels to realise our True Self, ultimately they move towards the same source- a Universal Self, hence actualising one’s vision serves the people, planet and all of creation. During the vision quest, we commune with the External Unifying Centre of Nature - our truest mirror. Doing so creates within us a new Internal Unifying Centre, which is like a new star for the planets of our personality to orbit, yet we still have the gravitational pull of the old star- hence we experience tension. The ego experiences this tension as suffering and avoids it at all costs. It is not until we begin to awaken at Soul level that suffering has meaning and symptoms become messengers of the Self. By ego I mean the structure that has been built based on the past and how we have learned to deal with these experiences. By soul I refer to the experiencer and experience of Spirit / Self in matter. “The project of the soul is not to annihilate the ego but to allow the soul to use the ego as the ego uses the hand.” (Thompson 1995). 1. Separation of levels between the True Self and the ego. In my personal example, I had attributed qualities of Self to my ego and believed myself to be an idealised image. I had developed a transpersonal identification. Questers who differentiate levels of experience prior to fasting are less likely to attribute transpersonal qualities to the ego. As guides, during preparation, we can include experiential learning on differentiating between ego, soul and Self. It provides reassurance to know about stages of incorporation and spiritual awakening prior to experiencing them. Assagioli’s four stages of spiritual awakening provide one such roadmap. (Psychosynthesis 1970). The key to incorporation is recognising that both our ego and our vision of Self in potential are simultaneously true, just at different levels. In Psychosynthesis terms, this is called “bifocal vision” which is to see the other as both Self in potential, and how they behave and act now. To see oneself in this way creates tension and requires compassion. When we cannot bear this tension, we hide things from ourselves. E.g. we may reduce the vision or runaway in spiritual flight and the world benefits less from our questing. 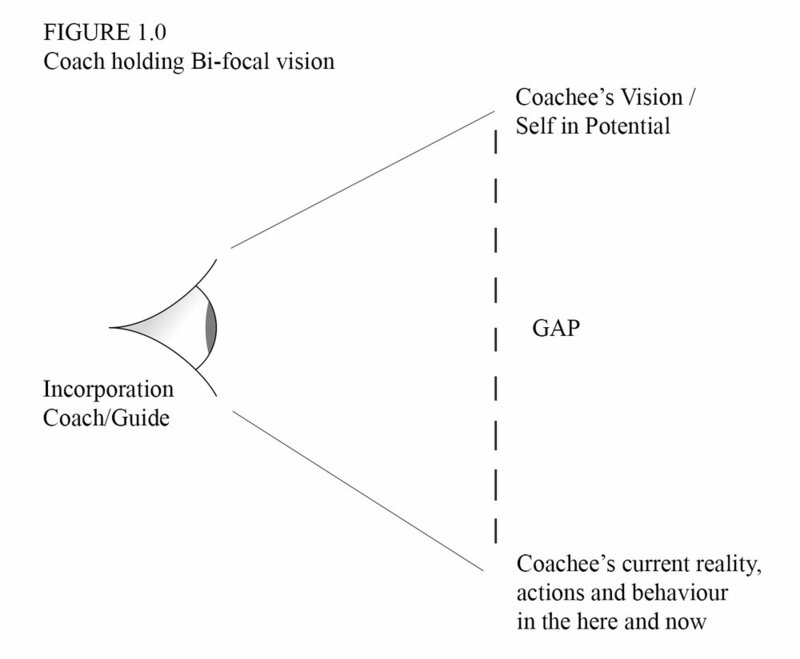 As an incorporation coach, I often find myself holding the larger tension and compassion for a coachee whilst supporting them to identify a third point within the “gap” (R Evans, Trifocal Vison). This third point is the place where there is most willingness/readiness to step towards their vision and begin to bridge the gap. For the coachee's Will to be engaged it is crucial the step is big enough to be meaningful yet not overwhelming. It is like helping someone walk a flight of steps or climb a mountain. “It is as though he had made a superb flight to the summit of a mountain top, realized it’s glory...but had been brought back to it’s starting point with rueful recognition that the steep path leading to it’s heights must be climbed step by step.” (Assagioli 1970). As the vision received is more often a direction than a destination, Incorporation Coaching has a different context to many forms of coaching. The work is about supporting the coachee to develop their own centre of “awareness and will” so they can hold themselves in the creative tension. In Psychosynthesis this centre is referred to as the ‘I’. The ‘I’ is pure awareness and will and the unique spark of Self/Spirit in matter. Once the coachee has sufficiently developed their ‘I’ they can bring their vision into the world and may no longer need coaching. They will still face fears and need to overcome challenging mindsets but they can choose not to be controlled by them - this is the art of dis-identification. Well supported incorporation begins in the preparation/ severance phase. I consider it important to ascertain if a quester has a sufficient level of ‘I’ development prior to questing and if not offer pre-work or an adapted or different ceremony. Older PostLife Crisis - Breakdown or Breakthrough?